I’ve never been a fan of critical feedback. Entering situations where potential conversations related to my performance are a possibility, my little voice goes into high gear trying to convince me that I am a complete failure and fraud and yelling at me saying I’d be better off to just quit. This means going into any type of performance evaluation, project kick-off or recap, or even just a check-in meeting, I swell with anxiety, fear and dread. I’m overcome with negative interpretations and diminished confidence which has a direct impact on my ability to be an effective and trusted leader amongst my team. My confidence when receiving feedback is — in part — a personality trait. It is part of my DNA and I need to accept it. However, I believe a larger part of my not viewing feedback as a gift is the lack of effective and honest dialogue from previous managers throughout my career. In fact, in my most recent Keep, Stop, Start meeting with my leaders, I reflected on past managers I’ve had and how little they were committed to developing me as a leader. Therefore, over the years, I’d been developing bad habits, which collectively are like a ball made of rubber bands. Each infraction of the bad habit was a new rubber band added to the ball, creating this mass that was diminishing my self-confidence and keeping me from being seen as the person and impactful leader that I know I am. We are big fans of feedback at ConvergenceCoaching! Working alongside my team for the last two years, I have become intimately familiar with it and its role in developing us as effective and trusted leaders. Some of us here have commented on how we’ve received more feedback in our time with Convergence than we have over the course of our entire career. In addition, I spent the last year in our Transformational Leadership Program™ (TLP) where, at the beginning of the program, you are required to identify key leadership goals on which to work during the year. This is an exercise in vulnerability. You must share openly with your peers and leaders an area of self that is preventing you from being a trusted leader within your team. I chose building my self-confidence and to find the courage to speak up, not be afraid to provide my thoughts and ideas, and to be open and receptive to feedback. We sometimes confuse authenticity with vulnerability and therefore, especially in our profession, shy away from being genuine. We are fearful of letting people in and getting to know us or us getting to know them on a deeper level. Although both authenticity and vulnerability are critically important leadership traits, Merriam Webster defines authentic as, “true to one’s own personality, spirit, or character.” Being our “true-selves” develops trust and unity with our teams. Commit to emotionally investing in your team. Our profession is in the the relationship business and we often stay with the same organization for the majority of our career. Our clients tend to stay with our firms for the majority of theirs, too. Care about the people around you. Consider them more like family and care about them personally. Doing so builds trust in the relationships. Genuinely caring about others on our team helps us give and receive the feedback without it being painful or awkward. Being an inspirational, effective and transformative leader requires us to hold the mirror up and challenge ourselves to continually develop and fine tune our skills. Finding the courage to ask for feedback on yourself builds a culture of courage and a framework for others around us to do the same. Also, be courageous in having the conversation with your up-and-comers when you identify areas where you can help them grow. The common theme of these three “be” strategies revolves around trust. When we trust in ourselves, and in others around us, we create a culture of unity and connectedness. The more unified and connected we are, the easier it is to have open and honest dialogue without fear, anxiety and dread. Rather, feedback becomes a growth opportunity helping us build healthier new habits, creating a new and improved rubber ball. It is natural to fall into patterns of known behavior, however acknowledging it when you are, trusting yourself and team, asking for help when needed and committing to continued learning is what keeps us growing forward. 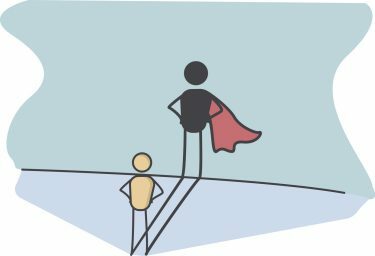 Is your confidence holding you back from being a trust member of your team? Do you fear feedback? Are you a leader looking to develop your feedback skills? Then be authentic, invest and act with courage. To learn more about this subject from our team in a live setting, you can also attend our webinar, “Fixing Feedback: Four Strategies to Better Develop Your People” taking place on September 27th. « Do You Have an Employee Engagement Strategy?